Precinct Level: President, Vice President, District Council Person, Secretary and Treasurer. After the Precincts elect their leadership the following District Officers will be elected: Chair, Vice Chair, Secretary and Treasurer. Delegates and Alternate Delegates to the State Convention will also be voted in on this day. This entry was posted in Maui Democrats on February 5, 2018 by Tim Lara. This entry was posted in Maui Democrats on September 24, 2017 by Maui Democrats. This entry was posted in Maui Democrats on August 8, 2017 by Maui Democrats. US Senator Mazie Hirono joining us! We are grateful that she will be able to spend some time with us. 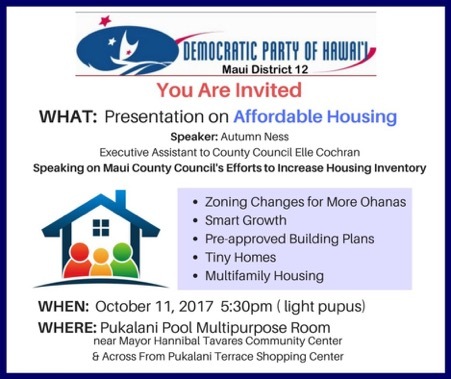 On MONDAY 8/7 from 5:30-7 pm we are having a Democratic Party District 12 Meeting in the Pukalani Pool Multipurpose Room. The purpose of our meeting is to discuss the Democratic Party’s “Summer of Resistance and Renewal” initiative. The goal of our statewide program is to organize districts and precincts and activate our members by getting them involved in upcoming meetings and events, canvassing members and putting a survey in the field, updating membership information that we collect on the doors, “cleaning up” the DPH database, and ultimately building a solid network of members across the state. This will enable us to help promote our legislative agenda based on the Party Platform. If you’d like to be involved but cannot attend our meeting, please let me know. Please let me know if you have any questions and I hope to see you there! This entry was posted in Maui Democrats on August 7, 2017 by Maui Democrats. Haiku meeting on Sunday, July 16th, 3:30 p.m. to 5:30 p.m.
Precinct 13-2 is sponsoring a Democratic Party meeting on Sunday, July 16th, 3:30 p.m. to 5:30 p.m., at the Haiku Elementary School cafeteria. The topic of the meeting is expanded healthcare options. Leslie Hartley Gise MD of Kula will be the guest speaker. She will discuss the current healthcare system in Hawaii and throughout the US, and options for improving it to better serve the people. The plan under discussion by the Republican Congress repeals the gains made under Obamacare and leaves millions of Americans behind. Dr. Gise is working with thousands of physicians nationwide to research and recommend a better way forward based on expansion of the Medicare system that we already have. This entry was posted in Maui Democrats on July 10, 2017 by Maui Democrats. Download the 2017 Maui County Convention Booklet! This entry was posted in Maui Democrats on March 31, 2017 by Maui Democrats. The Maui County Democratic Convention is coming up! Please join us! Time: 1:00 p.m. to 3:00 p.m.; registration begins at 12:30 p.m. Cost: $10 until Thursday, March 30; $15 thereafter and at door. – Meet and greet with your respective District Chair and Precincts. CLICK HERE to download the convention program. Any candidate or ally organization wishing to have a banner or a table at the convention, may be a convention sponsor starting at $100. Email Troy Hashimoto for more information. The Convention is open to any member of the Maui County Democratic Party or those interested in joining. Only members of the County Executive Committee, District Council, a Precinct President, First Vice-President or District Council Representative are eligible to vote on matters. Email Maui County Chair Troy Hashimoto for more information. This entry was posted in Maui Democrats on March 18, 2017 by Maui Democrats.